Metro Gathering MEGA Event at Waterloo Village! ﻿Home of the First & ORIGINAL Tri-Sate area Mega Event. Pre-Registration will open in April. ​Please log your Will Attend on the geocaching cache page!. Come enter the old historic Village for the 2019 Metro Gathering Event and join the entire New Jersey Geocaching community, as The Northern New Jersey Cachers, NNJC.org and Central Jersey cachers. CJC, hosts the 6th Annual area Metro Gathering Event !! Come see the once thriving historic town of Waterloo Village being restored to it's former glory, as we make the 2019 Metro Gathering theme "The Pirates of Port Royale" Come get into the swashbuckling Pirate spirit, walk among Buccaneers, Merchants, and Pirate crews as the old village alive as a Pirate town of Port Royale! The event is free, there is a $5.00 parking fee which 100% of this donation goes towards Waterloo Village historic preservation. Info can be found under event info tab. ​The 2019 "Golden Ticket" contest has started! ​good luck All Ye Treasure seekers! 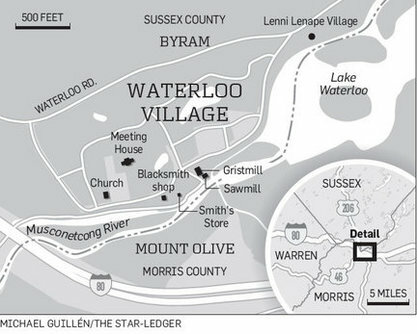 ​Waterloo Village Historic Site is located in beautiful countryside of Sussex County NJ. It is an easy access to major Highways of Routes 287, 80 and 206.